For a long time, the D300 occupied the only slot in Nikon’s APS-C (DX) format DSLR lineup. However, being a camera that was launched in 2009 and whose production ceased years ago, it’s safe to say that this Nikon D500 review was a long time overdue. The Nikon D500 is a winner in many ways, our favorite being that it provides an excellent blend of autofocus, imaging, and continuous shooting. All this is offered at an unbeatable price. This model was designed for serious professionals in need of a compact camera that can get the job done. In this review, we seek to explore the features, performance, as well as image quality of the Nikon D500 camera. 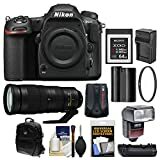 The Nikon D500 was one of the most awaited cameras in 2016, partially because the preceding APS-C DSLR camera was released in 2009, making it relatively outdated. Available since late April 2016, the Nikon D500 is an upgrade of the D300. This naturally means that it comes with several improvements and borrows a few features from the D300. However, the D500 body is built for the more sophisticated photographer. This section of our Nikon D500 review seeks to explore its best features and how they affect performance. It’s also important that our Nikon D500 review looks at the image quality and performance. From automatic white balance to a metering system that doesn’t throw up any surprises while working, the D500 camera performs well in all aspects. Its Matrix metering system boosts performance by recommending balanced exposure values. This also makes it possible for the camera to cope well in high and low light conditions. With 10fps burst shooting and 200 short raw file buffer, you never have to worry about overexposure when dealing with overly bright objects. This camera uses a CMOS sensor, which generates up to 20 megapixels. This sensor technology is the latest Sony Exmor with dual gain. Data passes from the sensor to a Nikon’s EXPEED 5 image processor before moving to a UHS-II type SD card or XDQ card. This Nikon D500 review wouldn’t be complete without taking a look at the autofocus system. It’s made up a new autofocus sensor with 153 detection areas. Out of those, 99 of them cross point. The sensor also has a dedicated CPU, which allows it to process data faster. Images on the Nikon D500 camera are well exposed, detailed and sharp. The video quality is also exemplary. Pictures and footage have lots of detail and improve depending on the ISO. While images are best at ISO6400, you still get good footage at ISO25,000 and more so at ISO51200, which is the highest native. The metal chassis is way more durable than of the D300 and the weather sealing is greater too. The absence of the pop-up flash allows for increased sturdiness while a waterproof seal provided with the hotshoe helps with waterproofing when the flashgun isn’t mounted. The grip on the front has a textured coating, which works together with the ridge on the back to provide a comfortable hold. Nikon D500 has intuitive controls including a mini-joystick that allows you select the AF point fast. There is also a rocker style navigation pad whose central button allows one to scroll down and alter the menu settings as needed. A dedicated ISO button sits behind the shutter release. A new button in the D500 is a thumbstick that controls the position of the autofocus sensor. The tilting bracket is certainly made with durability in mind. This Nikon D500 review wouldn’t be complete without also noting the changes made to the viewfinder. It has a 1.0x magnification, an improvement from the D300’s 0.94x. Battery performance is a little wanting. Before wrapping up the D500 review, it’s important that we make a few recommendations. The durable construction, great autofocus system as well as a shooting rate of 10fps makes the D500 a good camera for serious photography enthusiasts. It is a serious contender as an alternative to the Nikon D5, with high-end features that only professionals can take advantage of. We, however, wouldn’t recommend it for live videography. Although the Nikon D500 camera is one of the best in its price range, it can’t shoot 1080p videos and this is a deal-breaker for many professionals. If you are interested in a Nikon camera that can shoot 1080p videos, read our Nikon D5500 review and our Nikon D4S review. To conclude our Nikon D500 review, it’s safe to say that this professional camera is an instant classic. For something that was heavily anticipated, Nikon certainly did a great job getting many things right. The capture speeds allow you to get moments you may miss, controls are well laid out, the autofocus system is simply stunning and the compact size is a welcome feature for those who are always on the move. And while we are not particularly impressed with the quality of the battery, this is something that can be overlooked by most. All in all, the Nikon D500 will prove a worthy asset for anyone who loves professional-grade photography.